Long time, I hear you, assuming anyone still reads this, my apologies, but it was always going to be erratic, career changes are time consuming, but apologies nevertheless. A year or so ago I was asked by a museum curator to design and make a helmet pincel, or long thin triangular flag. He wanted to honour his brothers at arms in his 15th century jousting group. The client is well versed in medieval military matters and has high standards in his own armour and training and the project process was treated as any other design project. Initial meetings to establish requirements, preliminary sketches and ideas, project commencement and completion. This has been my most complex project to date, in that the flag is made of many elements, each had to be agreed with the client and allowing for the inevitable corrections and amendments. It is also one of the most rewarding as I had to focus and immerse myself in the project. Sadly I lost many of the final piece photos, but here are some late work in progress shots, poor quality, but they give you an idea, once I get time with the client, I shall take some shots of it in situ, on the helmet. St Mauritius (The Patron Saint of the Order) at the hoist, in gold harness and blue and red clothing. Six crescents - one large one signifying the Order of the Crescent (the modern version of the medieval order that existed) - five smaller crescents representing four current members and one that has left the order, the latter symbolised by the connecting vine having been severed. 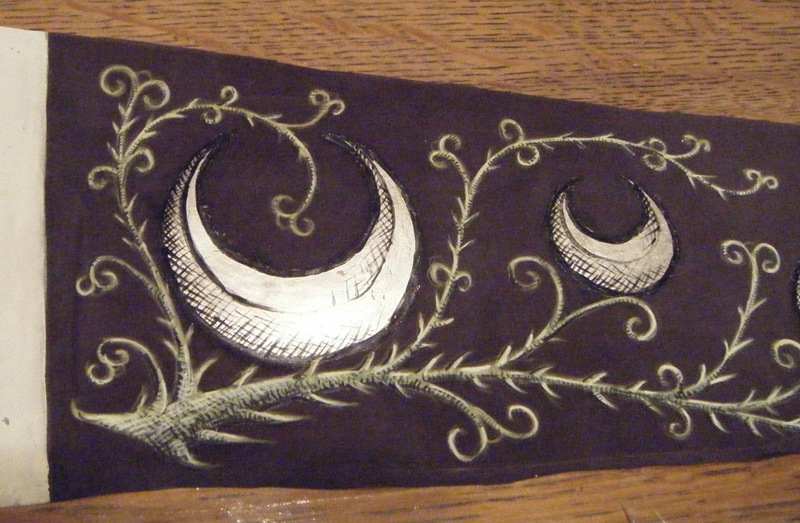 The crescents are unified by a trailing rose vine, spines along the base, offshoots with silver leaf 'buds' signify possible future members and growth, void areas are filled with green tracery, to fill space but to also join the elements, I judged there to be too much black space between the elements, it is also in keeping with such pattern seen in medieval images of flags and backgrounds. Gold leaf for St Mauritius' harness. Pigments: titanium white, yellow ochre, red ochre, lamp black, synthetic vermilion, genuine ultramarine, synthetic indigo, synthetic lead yellow. Binders - size, gum arabic. Modern agents - conservation grade clear varnish sealer for paint and silver areas. Fraystop for the cut edges. Length - 3 feet, tapering right angled triangle, bifurcated last 9 inches or so. I like experimenting with medieval painting techniques and the paint components themselves.